Bend, Oregon Daycations #1 Bestseller! 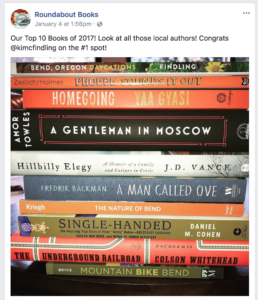 Roundabout Books in Bend, Oregon named “Bend, Oregon Daycations: Day Trips for Curious Travelers” their #1 bestseller for 2017! Yee haw! I am delighted and grateful for all the Bend-lovers and day-trippers out there. Keep it up, you amazing people. Grab your copy at Roundabout Books, Dudley’s Books, Clementine, Hello Sunshine and many more locations. See Bend, Oregon Daycations or www.benddaycations.com for more info and to order.